SHELBY — With the regular season over after last Friday’s home loss to the Crestline Bulldogs, the Galion Tigers started the post-season on Wednesday night with a clean slate, traveling to Shelby High School to play the Clear Fork Colts in a Division III sectional match-up. It didn’t go as well as the Tigers’ faithful had hoped. Galion’s season is over following an 81-51 loss. The game would be slightly delayed due to some confusion on who was to be the home team and who was to be the visitors. Galion dressed the part in their visitor blue uniforms and Clear Fork was set to go in their road black jerseys. Luckily, the Colts, except for Gannon Seifert, came prepared with the home whites in the locker room. The switch was made and warm-ups resumed but the fiasco would play a big part in how the game was to start. Galion was issued a technical foul for not wearing the proper color uniform, which meant that Clear Fork’s Chance Barnett would take two free throws to start the game and the Colts would be awarded possession. Barnett hit both shots from the line, giving the Colts the 2-0 advantage before a second rolled off of the play clock. Once the action finally commenced, the Tigers and the Colts would play a thoroughly entertaining first quarter. The advantage as the clock hit triple zeroes was to Clear Fork, 26-20. Second quarter woes then showed up for the young Tigers, scoring just four points in the eight-minute frame as the Colts poured in an additional 24 points to make their lead 50-24 heading into the intermission. 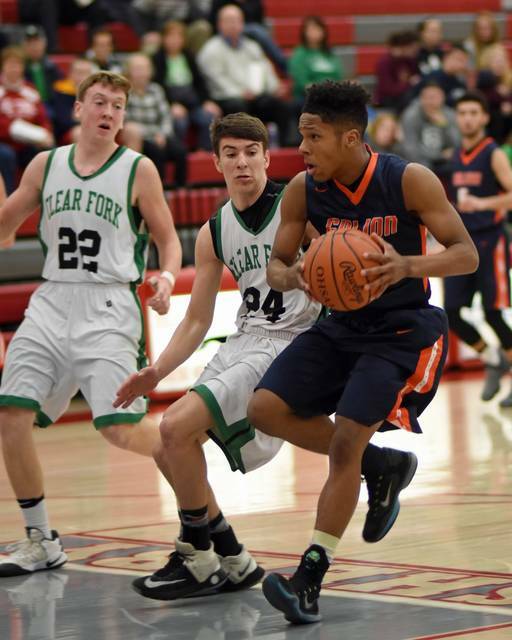 Galion was able to pick the scoring up a bit at the beginning of the second half but Clear Fork continued to shoot the ball exceptionally well and would maintain a lofty lead heading into the final quarter of play, 68-40. Barnett would start off the fourth with his first ever slam dunk, igniting the Clear Fork fans and teammates alike. By the time the quarter was over, the Galion season had ended and the Colts moved on with a 30-point victory, 81-51. Jack McElligott led the Tigers in scoring with 14 points off of the bench. Isaiah Alsip finished the ballgame with 12 points and Chase Cooke also finished in double figures with 10. Gage Lackey chipped in nine points in Galion’s efforts and Zhamir Anderson wrapped the scoring with six points. Galion stat line: 16/40 (40%) from the interior, 5/14 (36%) from the perimeter and 4/5 from the free-throw line; 29 total rebounds, six steals, six assists, three blocks and 19 turnovers. The Clear Fork Colts got double-digit scoring out of all five of their starters on the evening. Jay Swainhart had 15 points on five-three point field goals and Jared Schaefer also chimed in with 15. Justice Rebman finished the contest with 14 points and Chance Barnett had 13 points. Brennan South aided in the victory with 10 points. Clear Fork stat line: 21/37 (57%) from the interior, 8/20 (40%) from the perimeter and a perfect 15/15 from the free-throw line; 30 rebounds, 14 steals, 11 assists, two blocks and 11 turnovers. The Colts will now play the No. 1 seeded New London Wildcats at Shelby on Friday March 3 with a tip-off time of 6:15 pm.